I just bought a home-made long wheel base recumbent with an uncomfortable seat. In shopping for seats I noticed that many of the expensive seats look like computer chairs--padded seat and mesh back. Have any of you used a computer chair as a bicycle seat? 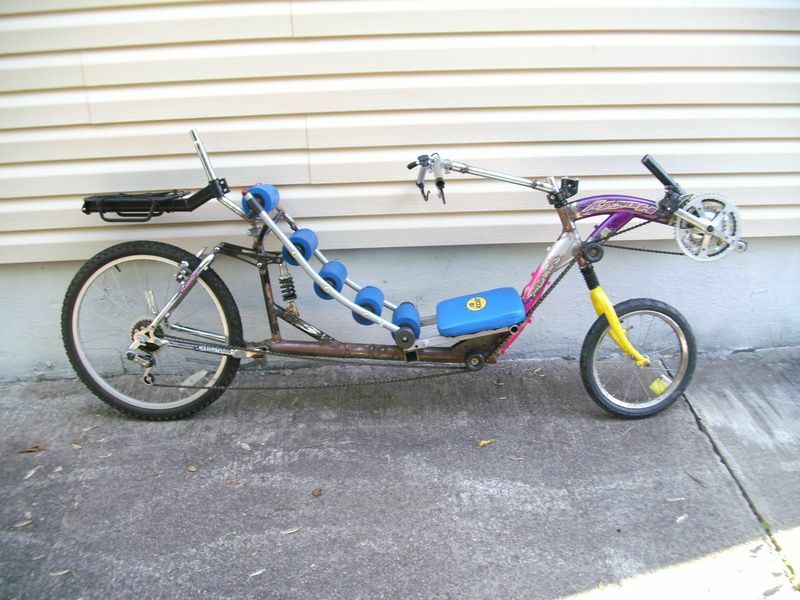 i haven't, but i've only tried making one recumbent. i used a cheap exercise thing for doing sit-ups. if i can get photobucket to let me i'll add a pic later. the only thing is, i haven't rode this more than a few minutes as test rides. it works for me, but i can't speak to comfort longevity over a real ride. i was thinking not having something that fully covered my back might be cooler (not nesessarily look cool. i mean something that let air get to my back so it wouldn't be as sweaty) i also just noticed it doesn't show a head rest i added later. it's fairly light and cheap though, if you come across one in a thrift store. as long as you don't have to permanently mod the bike to try it it's worth a try. Last edited by Philphine; 08-15-18 at 08:42 AM. What are the blue round things? just foam pieces. i don't know how it was originally supposed to work (kinda dought it did. picked it up used in a thrift store), but i guess they rolled on your back as you did situps. like i said, i've only done test rides (10-15 minutes at best), but it seems to work. i've since picked up a couple more for future recumbent tries. I can't sit in either of these awful things for long without messing up my hips. I like nice cushy seats or at least large ones. Now that IS interesting! You still need really good lights. I just rolled it home. I don't want to lean back much, in it, that's why it was free. Funny, my favorite computer chair is an exercise ball. Trying to imagine how I would integrate that with a recumbent (or upright). A unicycle might be easier. is this like the ribbon lawn chairs used to be made of? It's real similar. A few years ago I saw a YouTube video how to lace it and finish it at the end, but will have to search harder to find the right one later. It was a guy who redid a Lightning brand seat I think but can remember. Looks pretty cool to me. Have you added anything else to it since the last photo you uploaded? not really. between photobucket getting hinky and my garage being too full of junk to move things around (i don't know who sneaks into my garage and puts that stuff in there), i haven't messed with it much, beyond adding the headrest i mentioned earlier. not to mention i'm kinda scatterbrained about projects and have started a bunch of other bikes since. i'll get back to it eventually. Get a massage and a ride.